Some locations provide rich pickings when it comes to content strategy done badly. I’ve highlighted planes, trains and automobiles before. But in the last few years, a new poster-child for poor content strategy has emerged. 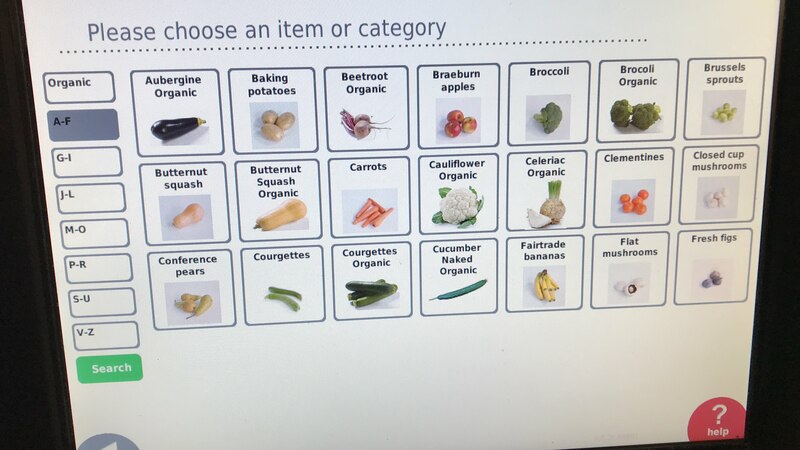 Have you ever paid attention to the content on the screen of the self-checkout machines in your local supermarket? They are, almost universally, terrible. Even the simplest of transactions can be peppered with confusing instructions, unhelpful prompts and hard-to-decipher errors. Here’s an example from my local Co-Op. They only sell Fairtrade bananas. That’s no bad thing, but they’re filed under ‘f’ for ‘Fairtrade’ instead of ‘b’ for bananas, which catches me out every time. Why is the capitalisation of ‘Butternut squash’ different to ‘Butternut Squash Organic’? What’s so special about the organic option that it merits the initial capitals? They’ve spelt ‘broccoli’ wrong, but only for the organic option. I can see how that combination of letters might catch you out, but you’d think a big supermarket chain would get it right. Although every single item on this screen is an item of fresh fruit and veg, the figs are the only item specifically identified as ‘fresh’. There’s a weird mix of the singular and plural. I can select ‘aubergine’ (single), but ‘baking potatoes’ (plural). What happens if I try to buy just one potato? None of these things is a disaster. You can still figure out this screen, find the right product and complete your purchase. But it’s a mess. It’s inconsistent, jarring and unpolished. It feels like a first draft, not like something you’d put in front of your customers. If a cashier serving people in person took the same slapdash approach, customers would leave confused and dissatisfied. The (lack of) content strategy on this screen makes it harder to navigate – especially if you’re in a busy supermarket with people waiting in line behind you. Some simple tweaks would improve it, but baking in content strategy from the start would have been better. Because if you can’t find what you’re trying to buy, why use a supermarket self-checkout at all?